Romania used many kinds of tanks during the war, bought or captured from France, Czechoslovakia, Germany or Russia. There were also attempts to create their own tank destroyers, but the Romanian industry was not able to create a 100% original vehicle, basing on imports. The first tank division was created in 1919, containing 74 Renault Ft.17 vehicles. During 1930s, they tried to modernise the arsenal, by buying new tanks (Renault R.35, AH-IV, Panzer 35(t) etc.). Many problems will appear during the fights on the Eastern Front, many tank models being outclassed by the new soviet T-34 and KV-1 tanks. This later lead to the creation of the Romanian tank destroyers, a basic adaptation to the original tanks, but with decent results. "Mareșal" Tank Hunter is a concept of antitank mobile cannon developed in Romania during the Second World War. From a constructive point of view it is similar to the Hetzer German tank hunter. Six prototypes (M-00, M-01, M-02, M-03, M-04, M-05) were built between December 1942 and January 1944. On October 26, 1944, the remaining prototypes and tanks' were seized by the Soviet army on the basis of the armistice. TACAM R-2 was an SPG used by the Romanian Army in the second part of the Second World War. The first prototype appeared in the summer of 1943 and was named "Tun Anticar pe Afet Mobil R-2". In total, 21 (one being the prototype) copies were produced from July 1943 until July 1944. In July 1944, under the 1st Battle Regiment, the 5th TACAM R-2 Company was formed under the 2nd Battalion Training, and was later transferred to Company 63 Antitanc. They have effectively taken part in the struggles for the liberation of Romania. Subsequently, following the decision of the Soviets to abolish the 1st Blind Division, the remaining 6 TACAM R-2 remained operational, were transferred to the 2nd Battalion Regiment, a regiment that took part in the liberation of Hungary and Austria. He survived the war in a single copy, being exposed today at the National Military Museum in Bucharest. TACAM T-60 (Antitank Canon on the Mobil T-60) was a tank destroyer used by the Romanian Armed Forces during the Second World War. 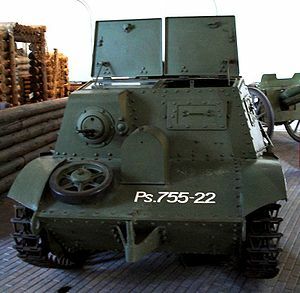 In 1943, thirty-four copies were transformed into Leonida Workshops using red Army captured material: the chassis was from the T-60 tanks, the superstructure armor was from the BT-7 tanks, and the F-22 cannons 76.2 mm Model 1936 were Soviet-made. The TACAM T-60 tank hunters have been used by the "Greater Romania" Division 1 and by the 8th Motorized Cavalry Division on the East Front. Thirty-four copies were converted to the Leonida Workshops by the end of 1943. Sixteen vehicles were assigned to the TACAM Company in the 1st Armored Regiment, and eighteen were allocated to the TACAM 62 Armored Regiment. However, the TACAM T-60 tank hunter units were sent where the situation on the front was worse. The Blind Cantemir Group, ad-hoc formed on 23 February 1944 to strengthen the defensive in northern Transnistria, had 14 TACAM T-60 vehicles, organized in two batteries. Tank hunters were returned to the 1st Armored Division to participate in Moldova's defensive during Operation Iasi-Chisinau. All TACAM T-60 tank destroyers who survived the events before and after August 23, 1944, were confiscated by the Red Army after October 1944. It is possible that one surviving vehicle to be located in Kubinka Tank Museum, if it was not already scrapped. The R-35 tank hunter was a version designed and produced in Romania by the French tank Renault R-35, used in the Second World War. Following the disastrous results of the Battle of Stalingrad, suggestions have been made to upgrade existing Renault R-35 tanks either by replacing the original turret with that of the T-26 light tank or by replacing the main cannon with a Soviet 45 mm or with a 47 mm Schneider antitank cannon. In December 1942, it was decided to focus the research on the replacement of the 37 mm original cannon with the 45 mm Soviet cannon obtained from the captured BT-7 and T-26 tanks, and the project was entrusted to Colonel Constantin Ghiulai and Captain Dumitru Hogea. The tunnel was attached to a frontal extension of the turret that would contain the kickback mechanism, but even so the interior space was too narrow to allow a ZB coaxial machine gun to be mounted. Additionally, the 45 mm bumpers were three times larger than those of 37 mm. 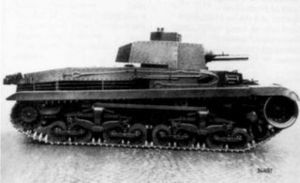 The prototype was completed at the end of February 1943 and, after being tested in the summer of that year, the Mechanized Troops Command ordered the conversion of 30 R-35 tanks. The 45 mm guns were reconditioned at the Army Army of Targoviste, while the storms were poured into the Concordia plants in Ploiesti. The conversion of the 30 tanks took place at the Leonida Workshops and lasted until June 1944. The vehicles, called the "The Ranger 35 (Transformed) Hunter", were returned to the 2nd Battalion Regiment. In July 1944, the Mechanized Troops Command ordered that the remaining R-35 tanks be converted, but events after August 23 prevented this. The R-35 hunters were used together with R-35 tanks in the Czechoslovak and Austrian campaigns, all of which were lost until the end of the war. Today, there is only one piece left of this tank, a turret discovered in the Hron river valley in Slovakia. The Renault EU was a tracked vehicle manufactured in France between 1932 and 1941 and used by the Romanian army. In 1930, at the request of the French infantry, the decision was made to design a lightweight, crafted armored vehicle capable of hauling and carrying ammunition for lightweight artillery pieces. In 1931, the contract was awarded to Renault, being chosen as the EU track and trailer. In 1937, the improved EU 2 was chosen for mass production. More than 5000 pieces were built from both versions, including under license in Romania at Malaxa factories, the Renault UE tracker being the standard equipment of the French infantry divisions. The T-1 scenic was a project developed by the Romanian Armed Forces during the Second World War. The Ford factory in Bucharest had to build between 1944 and 1945 a thousand trailed tractors, officially called T-1 (Tractor 1). These were to be used for towing anti-stick Reciţa Model 1943 75 mm caliber, manufactured in Romania. The vehicle was based on the Soviet tractor used in agriculture STZ. The vehicle was engineered by Military Engineers specializing in the Technical Division. The T-1 Stack was partially tested in the summer of 1944, with good results. The engines and transmission were to be manufactured by Rogifer, the Reşiţa plants made the frame and the propulsion, and the Ford factory assured the bodywork and assembly. Only five prototypes were built, because the Marshal tank hunter had priority. After August 23, 1944, the project was canceled. Tractor T-1 was the first tractor vehicle manufactured in Romania. AB md. 1941 (abbreviation: Autoblindat Model 1941) was the prototype of a self-propelled vehicle made by Resita plants during the Second World War. The armored vehicle was built in 1941 to enter the Romanian army, but it did not enter the production stage due to the limited industrial capacities of the Kingdom of Romania. The main unit of fire consisted of a 37 mm Czechoslovak cannon. AH-IV, named R-1 within the Romanian army, was assigned to the mechanized recognition squadrons of the cavalry brigades. Cavalry Brigades 5, 6 and 8 received six R-1 tanks, and cavalry brigades 1, 7 and 9 received four. Between 1941 and 1942, with the Cavalry Corps (made up of 5, 6 and 8 cavalry brigades), they took part in the actions of southern Ukraine and the Caucasus, but also in other areas of the front where cavalry units in Odessa). The Cavalry Training Center withdrew the R-1 tank from the Romanian army as a consequence of the defeat at Stalingrad. From this tankette, Romania created a prototype called R-1-a, produces in 1 copy. Panzer 35(t): As part of the army modernization program started in 1935, in August 1936 126 Škoda LT tanks.35 were ordered from Czechoslovakia. The first 15 tanks were received on May 1, 1937, but they encountered technical problems on the engine, which was incompatible with the climate and local fuel. Therefore, tanks were sent back and modified according to Romanian specifications. All 126 tanks (called R-2 in Romania) were received until 1939, but another order for 382 tanks sent in mid-1939 was denied by the Germans. R-2 was assigned to 1st Division Combat 1st Armored Battalion in 1941-1942. Acting as a shock unit, the Armored Division 1 gained considerable success in the battle for Chisinau, but in Odessa suffered heavy losses when the R-2 tanks were used to support the infantry, their thin armor making them a light prey for Soviet anti-tank rifles. At the end of the 1941 campaign, 26 R-2 tanks were damaged without recovery, so in 1942 Germany agreed to deliver 26 Panzerkampfwagen 35 (t) tanks almost identical but worn to cover the losses. The 1st Armored Division was rebuilt in the country until August 1942 and was assigned to the 3rd Army defending the Don's Cot. 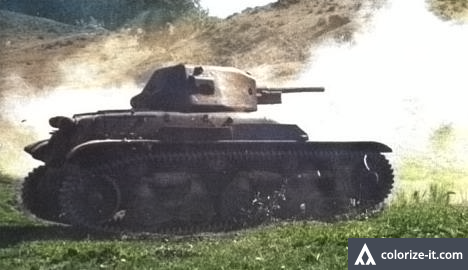 As the German-Romanian troops encountered an increasing number of T-34 tanks, Armored Division 1 tested the effectiveness of an R-2 against a captured T-34. The test proved that the T-34 was invulnerable in front of the 37 mm cannon of the R-2 tank. During the Battle of Don's Battle, where medium and heavy Soviet tankers created chaos among the exhausted and badly equipped Romanian troops, the Armored Division 1 lost 60 percent of the fighting capacity, crossing the Cir River with 19 R-2 tanks, some towed T-3 or T-4 tanks due to lack of fuel. The total R-2 tank losses at Stalingrad were 27 out of action, 30 abandoned due to fuel shortages and 24 due to mechanical problems. 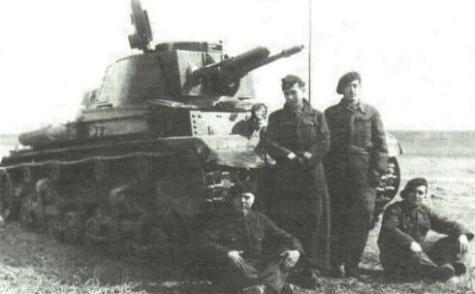 Some surviving R-2 tanks were used by ad-hoc armored detachments in 1944 (the Cantemir Armored Mixed Group on the Basarabian front and the Popescu Armored Detachment on the oil fields near Ploiesti). Two R-2 tanks that escaped the Soviet requisitions in February 1945 were used by the 2nd Regiment to fight during operations in Czechoslovakia and Austria. Both were lost on 12 April 1945 to Hohenruppersdorf, northeast of Vienna, when the 2nd Battalion Regiment rejected a German counterattack consisting of elements of the 3 Panzer, 25 and 26 SS divisions. 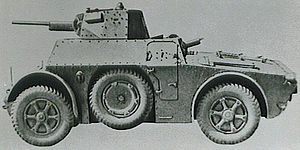 Renault R35: In December 1937, Romania began negotiations with France for the inauguration of a production line for armored vehicles in the country. The planned production included 200 Renault R-35 tanks, but the deal could not be completed and eventually the tanks were ordered from France. The needs of the French Army, as well as concurrent exports to Yugoslavia, Poland and Turkey, have slowed the delivery of the product. Only 41 Renault R-35 tanks were received until 1939, deliveries ceased after the fall of France in 1940. At the end of September 1939, a total of 34 Polish R-35 tanks in the 305 battalion that had fled to Romania was taken from it on the basis of a Romanian-Polish agreement, resulting in a total of 75 R-35 tanks available for service in the Romanian army at the end of 1939. The R-35 tanks endowed the 2nd Battalion Regiment, established on 1 November 1939 Several adjustments were made to the original vehicle, such as replacing the 7,5 mm Chatellerault machine guns with 7,22 mm lightweight ZB machine gun, improving suspensions or replacing wheels with rubber rims with some more resilient with metal wheels designed by the lieutenant - Colonel Constantin Ghiulai. Since the operational characteristics of the R-35 tanks compared to those of the more modern R-2 Tanks in combat regiment 1 were different, it was decided before June 22, 1941 that the Armored Division 1 would retain only the Regiment 1 which fought, the Regiment 2 the battle was transferred to the 4th Army General Headquarters. They were used to free Bessarabia and Northern Bukovina and to the siege of Odessa. Although they enjoyed considerable armor, their low speed and weak cannon retained them solely for the role of infantry support. Panzer 38(t): Between May and June 1943, Germany delivered 50 Panzerkampfwagen 38 (t) used tanks to the Romanian Kuban district. The tank was produced at the ČKD Czech factories between 1939 and 1942 for the German army, so that until the invasion of the Soviet Union in 1941 it had become quite common among the Wehrmacht troops. Leaving aside their poor condition that led to the German-German understanding, the tanks were only slightly superior to the R-2 and still remained vulnerable to all Soviet anti-tank guns and rifles. They were named T-38 and formed the T-38 Tank Battalion of the 2nd Battalion Regiment, with Companies 51, 52 and 53 comprised of 15 tanks each. In the winter of 1943 and 1944, Temporary Company 54 was created with the five T-38s of the battalion headquarters. The unit became operational in June 1943 and was attached to the Cavalry Corps in July. They took part in defensive battles in Kuban and Crimea. Since November 1943, T-38 tanks from companies 51 and 52 have been evacuated to Romania. However, in April 1944 there were still ten T-38s from Tank Company 53 as support of the 10th Infantry Division in the Crimea. Many were lost in these operations, and in August 1944 the Battalion 2 Regiment could barely throw a nine-tank T-38 company into battle. They participated in the battles around Bucharest and the oilfields near Ploiesti, and in March 1945 the fortification of the rivers Hron, Nitra, Váh and Moravia in Czechoslovakia and then in Austria. Until April 22, 1945, the regiment still had in possession five highly used T-38 tanks which were confiscated by the Soviets. 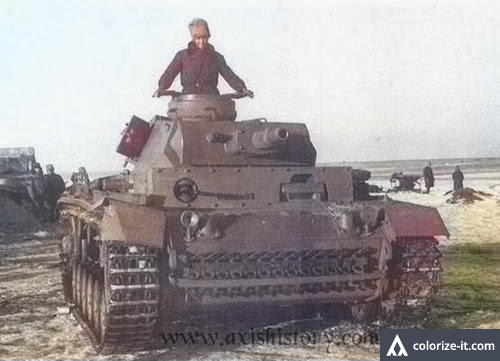 Panzer III: 12 Panzer III tanks were delivered to the Romanian Army in the autumn of 1942. 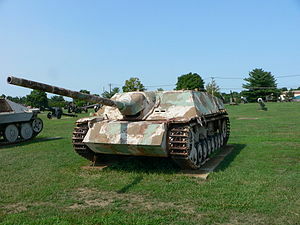 These were the Ausf model. N, painted in khaki color. The tanks were officially named T3 (or T-III) by the army and were inscribed with both the German cross and the "Mihai Cross" to avoid confusion among the Axis armies. Almost all T3 tanks were lost during the Battle of Stalingrad and the Don's Cote, except for one tank. Another copy was kept in Târgovişte for instruction. This type of tank was not delivered by the Germans to the Romanian Armed Forces, being considered outdated. 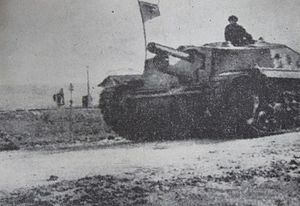 The two T3 tanks were later assigned to the Joint Battle Group Cantemir, formed on February 24, 1944, being lost during the fighting for the defense of Transnistria. Panzer IV: Romania received from Germany a total of 138 Panzer IV tanks called T IV in the Romanian army. Of these, 11 were the G model, delivered by Germany in September-October 1942, before the Battle of the Don, and the remaining 127 were the H and J models (possibly the previous G model) delivered between November 1943 and August 1944. Most of these armored were lost in the fights on the eastern front in the spring and summer of 1944, and a small number who survived fought on the western front in Transylvania, Czechoslovakia and Austria. At the end of the war, only two T IV tanks were still operational, participating in the military parade of August 23, 1945. Renault Ft.17: The first Romanian Armored Force Battalion, Battle of Fighters, was established in 1919. It was equipped with 76 Renault FT-17 tanks, obtained as a result of the cooperation between Romania and France. Of these, 48 were equipped with a Puteaux tunnel (caliber 37 mm) and the remaining 28 with a Hotchkiss (8 mm caliber). The crew of the Renault FT-17 tank was made up of two people: the mechanic and the commander, who operated the rotating turret. Between the two world wars, some of the FT-17 tanks were refurbished at the Leonida Workshops and the Army Arsenal in Bucharest. With the outbreak of the war against the USSR, the already obsolete FT-17 tanks, renamed FT meanwhile, formed the FT Battle Battalion, an independent unit tasked with security and training missions. During the conflagration they were used to protect important cities and industrial centers in Romania (Bucharest, Ploiesti, Sibiu, Resita). They therefore made a decisive contribution to the elimination of German resistance in these locations after the coup d'état of 23 August 1944. In February 1945, the Soviet army seized all copies of the Romanian army, except for one, kept today in the National Military Museum from Bucharest. Komsomoleț T-20: In 1943, the Romanian army decided to refurbish 34 Komsomolet T-20 tractors at the Rogifer plant (previously called Malaxa). The official name was the Russian Sheenalet Capture Ford. The engine of these armored tractors was manufactured under Ford's license. Since in Bucharest there was Ford Truck Factory, maintenance and refurbishment were relatively simple. The vehicles were equipped with a towing hook to tow the German anti-tank gun 50 mm PaK 38. The armored tractors were distributed as follows: 12 pieces were sent to the 5th and 14th Infantry Divisions, six were delivered to the Regiment 2 Fight and four were sent to the 5th Cavalry Division in August 1944. All vehicles were lost on the Moldavian front in the summer of 1944 or seized by the Soviets after August 23, 1944. StuG 3G: 100 StuG III Ausf. G were delivered to Romania in autumn 1943. They were officially named TAs. In February 1945, 13 assault guns were still in the army's inventory. No copy of this delivery has caught the end of the war. In 1947, 31 TAs were in the inventory of the Romanian army. Most were StuG III, but there was also a small number of Panzer IV / 70 (V), officially named TAs T4. 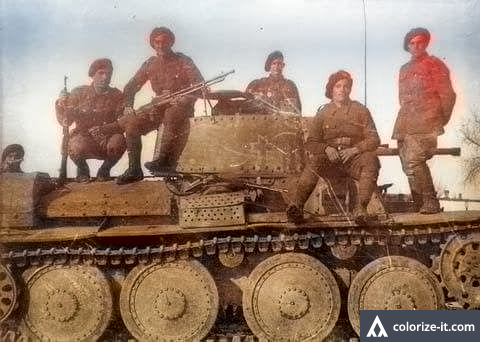 These StuG III came from the Red Army's capture stocks, as well as the repair of units out of the war during the war. StuGs were used until 1950, when they were replaced by SU-76 Soviet manufacturing. Until 1954, all German tanks were dismantled. 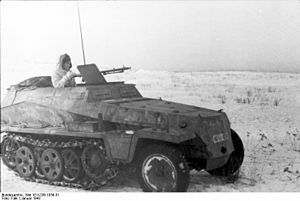 SdKfz 250: A Motorized Infantry Battalion of the 1st Armored Division was equipped with semi-dented SdKfz 250 (called light SPW) and 251 (called medium-sized SPW) between 1943 and 1944, supplied by the German army following the Olivenbaum arming plans. Most of the vehicles were already used when they were received by the Romanian army. The motorized infantry battalion thus became the equivalent of a Panzergrenadier battalion within the German army. In March 1945, 5 SPWs were still in the inventory of the 2nd Battle Regiment. Only 3 SPW vehicles were in the army after signing the armistice. Leichter Panzerspähwagen: The Leichter Panzerspähwagen were organized in reconnaissance companies within armored divisions and were officially named AB in the Romanian Army's inventory. On December 12, 1942, the Armored Division 1 research group was equipped with a SdKfz 222 vehicle (10 vehicles). 40 SdKfz 222 trucks were delivered to the Romanian Army since September 1943 following the Olivenbaum Armament Delivery Plan. The Niculescu detachment had 5 SdKfz 222 vehicles available during the battles for the liberation of Transylvania in September 1944. In early 1945, the 2nd Battle Regiment had 8 SdKfz 222 armored cars. 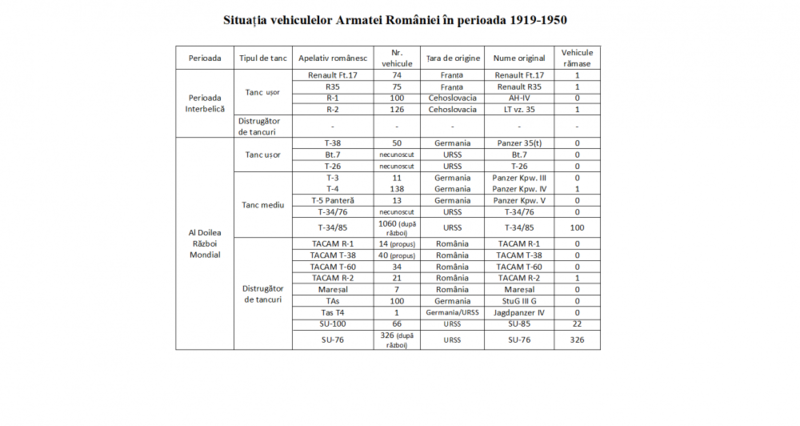 On November 15, 1947, the Romanian Army had 13 SdKfz 222 dealerships in their possession. AB-41: 8 AB 41 were delivered to Romania at the end of 1943 following Olivenbaum's contingency plans. These were confiscated by the Germans after the truce signed by Italy and delivered to Romania. OA vz 27: Little is known about the career of the OA vz. 27 in Romania after one Czech platoon of three sought refuge there in March 1939 other than it performed internal security duties. Two were destroyed during one of the American bombing raids on Ploiesti during the summer of 1944 while being serviced at the depot there. OA vz.30: Almost nothing is known about the career of the OA vz.30 in Romania after one Czech company of nine sought refuge there in March 1939. 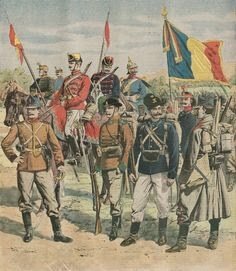 One unconfirmed report says that some were on the strength of the Romanian dictator Antonescu's bodyguard unit (Batalionul de gardă al mareşalului Antonescu or Regimentul de gardă al Conducătorului Statului). Supposedly three were destroyed during American bombing of Ploieşti in the summer of 1944 while being serviced at the depot there. 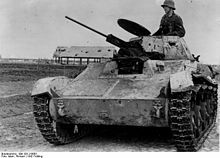 Flackpanzer Mareșal: Flakpanzer Mareșal was a German proposal to modify the Romanian tank hunter "Mareșal" in an anti-aircraft vehicle. The German version was supposed to be armed with two 37 mm anti-aircraft guns. This proposal has never gone beyond the sketch stage. Hetzer: Two Hetzers were captured during the battles for the liberation of Transylvania (September-October 1944). These were used by the Romanian troops for a short period, but were later handed over to the Red Army under the terms of the truce signed on September 12, 1944 between the Soviet Union and the Kingdom of Romania. Zrinny II: A functional Zrinny II was captured by the Romanian troops in September-October 1944 in Northern Transylvania and was used for a limited period of time. Later, it was seized by the Red Army. T-26: at least 2 have been captured by the Romanians and used during the fights on the Eastern Front. T-60: vehicles captured by the Romanian army have been mostly converted in the TACAM T-60 tank destroyer. 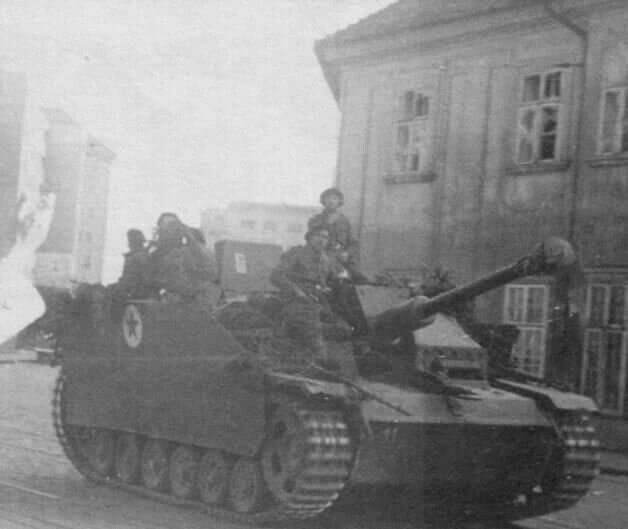 Jagpanzer IV: At least one Jagdpanzer IV / 70 (V) was in the Romanian Army after the end of the Second World War. It came from the Red Army's catch stocks. 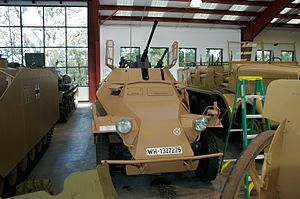 The official name of these vehicles was TAs T4 (T4 tank-based assault vehicle). 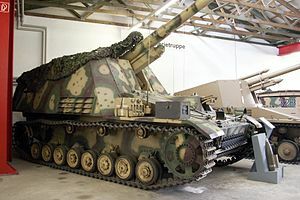 German autotunes were used by the Tudor Vladimirescu-Debrecen Armored Artillery Regiments until 1950, when they were replaced by Soviet SUVs SU-76, SU-100 and ISU-152. Panzer 5 Panther: In May 1946, Romania received 13 PkKpfw V Panther tanks from Red Army stocks. The tanks were initially used by the 1st Brigade of Tanks, and later they were assigned to the Tudor Vladimirescu-Debrecen Division. The 13 tanks were different models (Ausf A, Ausf D and Ausf G) in an advanced wear state. However, they were painted and inscribed with the emblem of the Romanian Army. 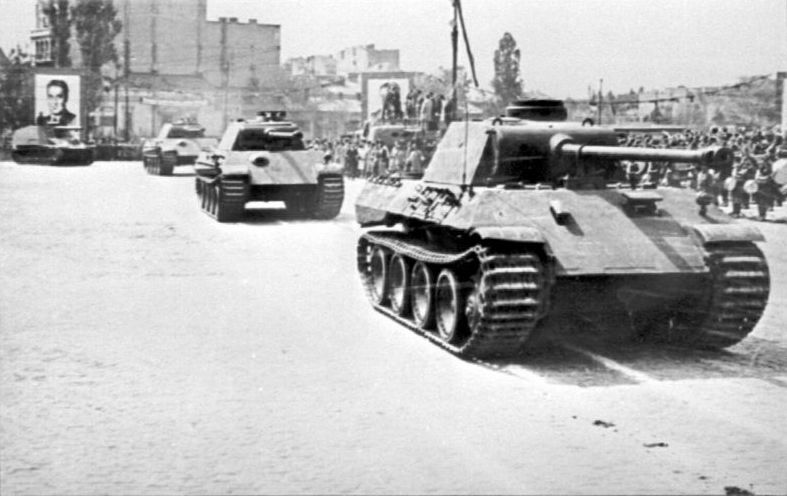 Officially, the tank was named T5 Panther, in 1948 it was painted with the new emblem of the Romanian Army (cockarde). In 1950, all 13 tanks were abandoned and replaced with T34 / 85. The T5 Panther was used for training, military maneuvers and parades, such as May 1, 1948 in Bucharest. 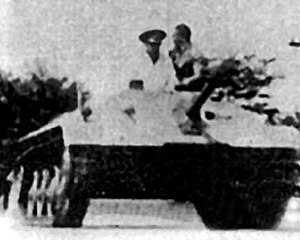 Until the introduction of Soviet manufacturing tanks, the T5 was the heaviest armored at the disposal of the Romanian Armed Forces. Hummel: The Romanian Army received only one Hummel from the Soviet stocks at the end of the Second World War. The self-propelled cannon was used by the 2nd Battalion Regiment. The vehicle was officially named Hummel TAs, with registration number U069009. Autotun could not be used because it lacked the cannon lock. However, he participated in 1946 at the military parade on the national day of the Kingdom of Romania in Bucharest, being inscribed with the emblems of the Romanian Army. T-34: During the Second World War, the Romanian troops captured a small number of T-34 tanks, but they were only used for a short period due to the lack of spare parts. Most captured tanks were sent to Romania for testing and training. The plans of the General Staff to produce a copy of the tank in Romania did not materialize because of the embryonic autochthonous industry. All Soviet manufacturing tanks were seized by the Red Army after August 23, 1944. R-3: In the middle of 1940, the traditional arms suppliers of Romania, France and Czechoslovakia were under German influence. 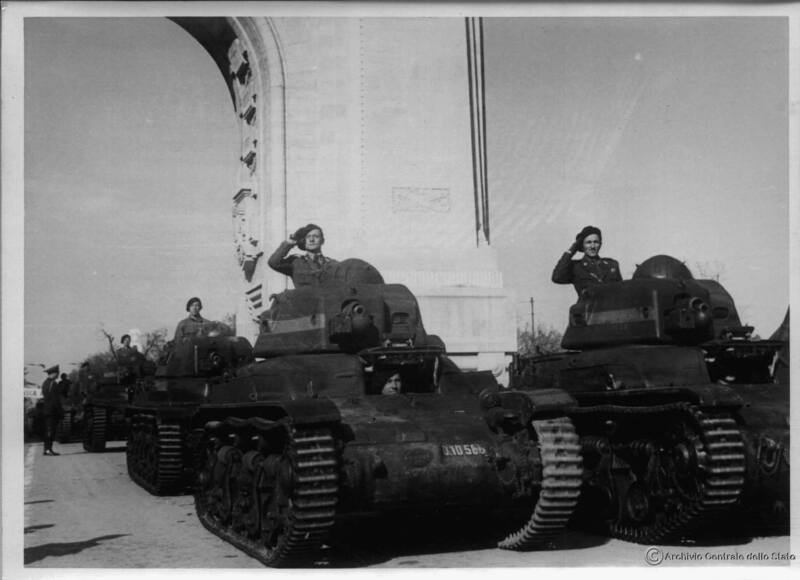 Deliveries of Renault R-35 tanks were stopped after the French Army defeated. Because the army's equipment was precarious, Romania wanted to buy 216 medium Skoda T-21 tanks. This tank, originally called S-II-c, was the successor of LT vz. 35, already in the armament of the Romanian armed troops. The tank is about 17 tons and is equipped with a 47 mm cannon and an armor with a thickness between 16 and 30 mm. The attempts of 1940 did not materialize because Romania was not yet officially a member of the Axis. Negotiations were resumed because Germany sold the license to build the T-22 tank in August 1940. 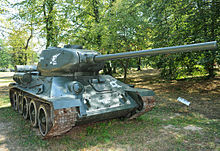 The T-22 was a variant of the T-21 tank and was later built in Hungary under the name of 40M Turán I. In January 1941 , Romania tried to buy this tank again, but the order was not delivered due to limited industrial capabilities, despite the efforts of the Romanian and German governments. In June 1941, Romania tried to build under the license 287 T-21 tanks, officially named R-3, but the project was abandoned due to the limited industrial capacities of Skoda plants and the Romanian embryonic industry. TACAM R-1: TACAM R-1 (Antitank Gun on Mobile Support R-1) was a project developed by the Romanian Armed Forces during the Second World War. On 22 November 1943, the General Staff decided to turn the 14 R-1 tanks available in TDs. Tank hunters were supposed to be equipped with a Soviet anti-Soviet canon (of catch stocks) of 45 mm and they had to guard strategic objectives in Romania. The project was canceled because the utility of this vehicle did not justify the resources needed to develop. TACAM T-38: TACAM T-38 (Anti-Tank Canon on T-38) was a project developed by the Romanian Armed Forces during the Second World War. In 1943, the State Staff decided to convert dozens of T-38 tanks into tank hunters, following the TACAM R-2. Fourty guns of 76.2 mm (s) of Soviet manufacturing were retained for this plan. Since the TACAM R-2 project has not been completed, TACAM T-38 plans have not been put into practice. 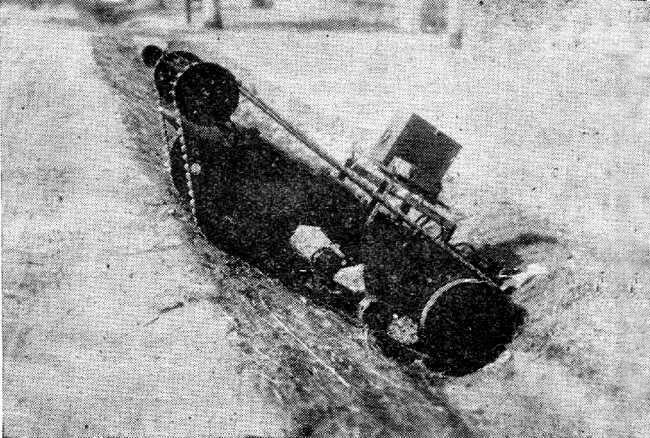 Romanian "Goliath": During 1944, Romania designed and built its own model of remote-controlled tracked mine, known as "Romanian Goliath", due to lack of information about its actual name. However, it was markedly different from its German counterpart. The few surviving photos show that the vehicle had no armor, and it is not known if that was ever changed. It did have some logistical improvements, however, as the Romanian-designed chassis allowed it to cross trenches and craters much better than its German counterparts. Little is known about the stats of this Romanian vehicle, aside from the fact that it never went beyond the prototype stage and that it weighed about two tons. If there is anyone curious, I also made a video version of the subject (English subtitles included). Enjoy!